The catholic Chapel and the university of Moorhead Minnesota was the site for this wonderful mass service. This was the second marriage for Unique moments Photography and this family. Daughter #2 met the man of her dreams while attending school at the University. A man in Uniform who serves our country. The scene just doesn't get any better. Of course it helps when you know the family and the bride and groom are two outstanding people. Everything was perfect. 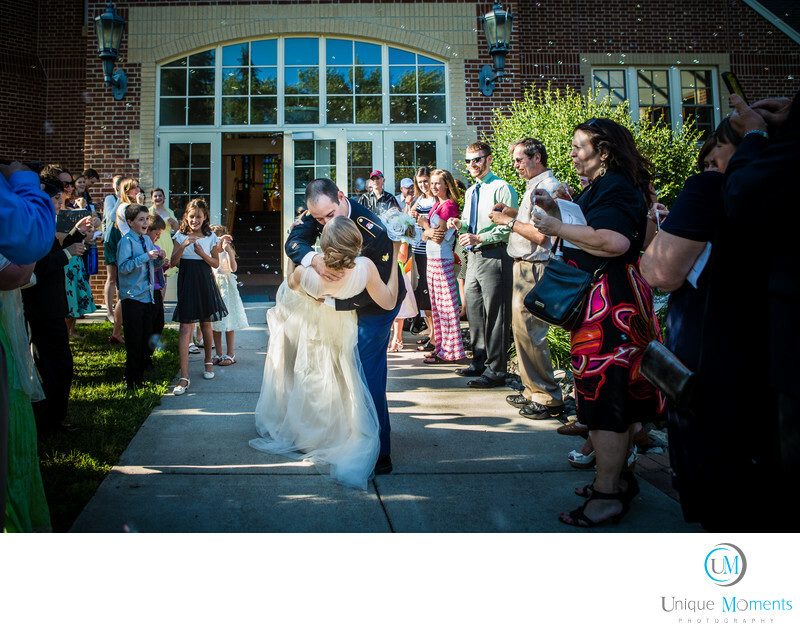 We knew the guests were outside getting ready to blow bubbles all over the bridal party when they walked out. So We convinced the groom, with out the bride knowing what would happen, that it would be a good thing to grab his bride and give her a big Dip and Kiss as they were heading out of the church. Man he nailed it and it was one of our favorites from the 2013 season. Location: 1104 7th Ave South Moorhead, MN 56563.